The city shapes us & we shape the city. 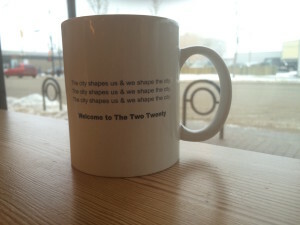 The line above adorns the new coffee mugs at The Two Twenty, reflecting both the coworking space’s openness to a range of people and organizations, and its influence on the surrounding neighbourhood of Riversdale and the city of Saskatoon as a whole. Whether those mutual influences are beneficial or harmful (or both) doesn’t come into the equation of that simple sentence: it’s taken as a given that we cannot separate the two, that even if one has more “power” at any given moment, the influence will be inherently reciprocal. If the “we” in that line is used to refer to your non-profit organization or the “for-impact” sector in your city (or town or village or region), does the idea of mutual influence and change hold true? In asking that question, I don’t mean the surface level factors of who we serve, who we collaborate with, and which funders we apply to. I’m not talking about the metrics of how many individuals or families came through your door and participated in your program and escaped poverty as a result. Understanding community demographics and trends is a good start, as is realizing that a successful program model created for downtown Toronto cannot be imported whole-cloth to suburban Saskatoon (or vice-versa) without some modifications. But that’s only a start. What would it be like if we opened our ways of acting and being in our communities to allow ourselves to be shaped and to shape in return? Wait, let me start with a different question – how many times have you learned about an interesting program or model being used elsewhere and immediately set out to figuring out how to implement it in your context? Don’t be shy, I’ve been guilty of this one too, and there’s nothing wrong with learning from others and adapting good ideas. The problem comes in starting with the solution and a vaguely-defined problem: we’re not longer shaping the city, we’re imposing a specific idea of what should be on it. Here’s an alternative: start by allowing the city to shape you. Take some time to learn about and connect with the different individuals and organizations who, like you, have a stake in the well-being of the community: local residents, businesses, government officials, neighbourhood groups, and other for-impact agencies, just to name a few. Host a community conversation where the primary purpose is for you to listen to what others think about your organization and the issue you’re trying to tackle, instead of selling your program to donors or trying to recruit new participants. Create organizational procedures and structures that encourage regular (and meaningful!) community input for your programs, strategies, and overall direction. Build on the existing knowledge, relationships, skills, and other strengths that your participants bring to the table, instead of viewing them as a bundle of needs and deficits. At the same time, look for opportunities for broader change-making. The for-impact sector as a whole contributes more to our country’s GDP than the retail sector and in the same ballpark as mining and oil, but we often fail to leverage our strengths and collective voice to shape our cities and societies. I’m encouraged by the growth of approaches like Collective Impact, promoted by Tamarack here in Canada and FSG south of the border. The model provides a framework for community members and organizations to identify a common issue, determine a shared agenda, and work together to bring about change: this and other approaches can help turn our dreams and visions for what could be into reality. We all exist somewhere. We all call a community home. That place will shape us, if we let it: in return, we all have the opportunity and the duty to contribute in return.